This timer is here to help our global audience know exactly when this special discount will expire. Around Money, Success and Happiness in Just Minutes a Day? Subliminal Affirmations (Combined with Theta Brainwave Entrainment): Combining subliminal affirmations with audible brainwave entrainment creates a more effective program that focuses on specific results. Soft, subliminal affirmations are mixed within the music in such a way that we cannot hear them consciously. However, they are directly “heard” by our subconscious mind adding another layer of support for effective change. While healing frequencies balance and open your mind, subliminal affirmations communicate with your subconscious to release fears and frustrations. This allows you to automatically break your old, habits and routines to replace them with new, positive, successful, uplifting behaviors. Entrainment cycles, frequencies, and patterns of complexity continue to enhance the benefits over time. 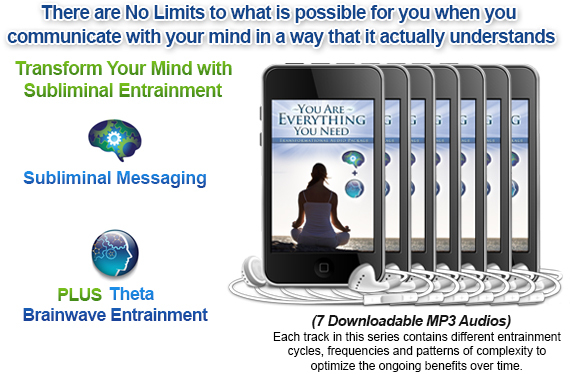 The addition of subliminal messaging encourages deeper integration of the affirmations. This process bypasses rejection by the conscious mind while reaching your subconscious mind for unconscious auto-suggestion. relax and allow the recordings do all the work for you. into your left ear in order to be best received by your right brain. Opportunities flow easily to me. Happiness and joy you experience ultimately. I take time, every day to give thanks for what I have. The world love you and your unique abilities. I am blessed with continuous success. Awake you are to knowledge that your have everything needed. I am naturally thankful for all the opportunities that come my way. Complete and ready for the world you are now. Negativity is naturally transformed to thoughts of success. Opportunities awaken now to you everyday. I easily accomplish what I set out to do. Streaming opportunities flow to you. I habitually count my blessing every day. Life offers you joy and you accept. I am driven to succeed in ways that are good for me. Creativity like seeds they grow big and tall. I balance success with happiness. Success everyday you enjoy more and more. I feel happy when I think of my success. Success, happiness are in balance for you. My success blesses the world. As opportunities come, thankful you are. As I dream, my higher self continues to plan for greater success. Feel successful you do. I love my life. Successful you now are. I find that I am often in the right place at the right time. Dreams of live successful create. My beliefs are changing in a way that increases my success. Positivity for you flown now easily. I am genuinely happy when I see others succeed. Negativity transforms to success in your mind does. It is easy for me to feel gratitude. With you, confidence grows and blooms it does. The more successful I am the happier I become. Joyful you are as you achieve everything now. It is safe for me to be successful. Healthy vibrant and full of passion you are. My ability to be thankful ahead of time is growing every single day. The world and you feels love for who you are . Now all that is left is to try for yourself. it simply ask for a refund. This enhancement is ready for immediate download.